Glaucoma. Detailed anatomy of Glaucoma and healthy eye. Glaucoma is a health problem where the normal fluid pressure inside the eyes slowly builds up and doesn’t drain properly. Instead, the fluid collects and causes damage to the optic nerve. The optic nerve is a bundle of nerve fibers that connects the retina with the brain. This damage leads to loss of eyesight. The causes of glaucoma are unknown. 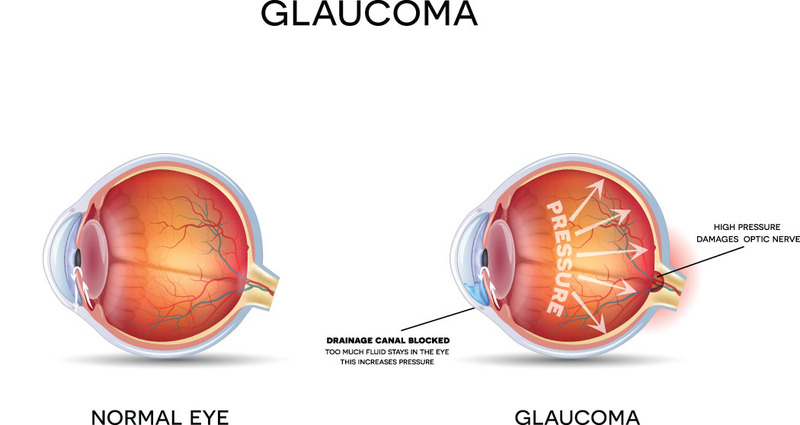 Even people with normal fluid pressure inside the eyes can lose their eyesight from glaucoma. Race. Glaucoma is the leading cause of blindness for African-Americans. Age. People ages 60 and older are more at risk for developing glaucoma. Family history. People with a family history of glaucoma are more likely to develop the disease. High fluid pressure inside the eyes. People with a high fluid pressure inside the eyes are at an increased risk. Anyone in these risk groups should get an eye exam with dilated pupils every two years. Most people who have glaucoma do not notice any symptoms until they start to lose some of their eyesight. As optic nerve fibers are damaged by glaucoma, small blind spots may begin to develop. They usually happen on the side or in their peripheral vision. Many people do not notice the blind spots until significant optic nerve damage has already happened. If the entire nerve is destroyed, the person becomes blind. The symptoms of acute angle-closure glaucoma may look like other eye problems. Get medical attention right away if you notice symptoms in order to prevent blindness. Visual acuity test. The common eye chart test measures how well you can see at various distances. Pupil dilation. The pupil is widened with eye drops to allow a close-up exam of the eye’s retina. Visual field. This test measures a person’s side or peripheral vision. Lost peripheral vision may mean a person has glaucoma. Tonometry. 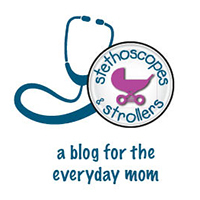 This standard test determines the fluid pressure inside the eye. The symptoms of glaucoma sometimes look like other conditions or medical problems. Always see your healthcare provider for a diagnosis. Medicines. Some medicines cause the eye to make less fluid while others lower pressure by helping fluid drain from the eye. Surgery. The purpose of surgery is to create a new opening for fluid to leave the eye. Laser surgery. There are several types of surgeries using a laser that are used to treat glaucoma. Tube shunt. A surgical procedure in which a flexible plastic tube is placed in the eye to help drain fluid. In some cases, a single surgery isn’t enough to slow down the progress the glaucoma. In those cases, repeat surgery and/or continued treatment with medicines may be necessary. 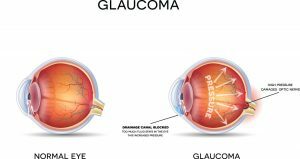 What are the complications of glaucoma? Without treatment, glaucoma can cause permanent blindness. To help prevent your glaucoma from getting worse, it’s important to follow your healthcare provider’s advice. If you have already lost some of your eyesight, ask your healthcare provider for information on services for people with low vision. There are devices that may help you with your everyday tasks.